Etching glass can turn a cabinet full of mismatched containers into a collection with stenciled designs. 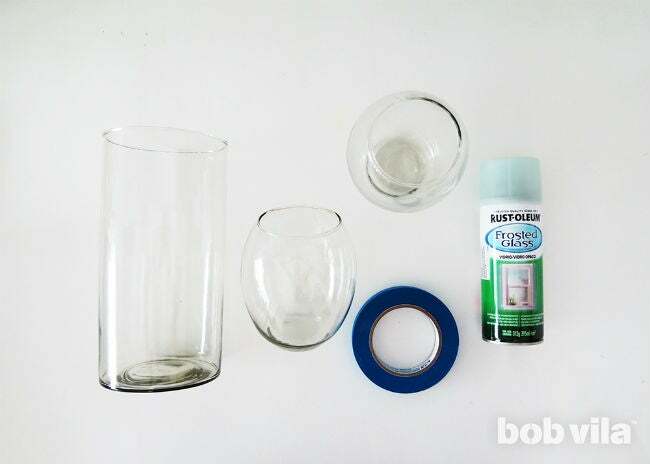 For this four-step tutorial, break out the frosted glass spray paint to achieve this semi-transparent effect. If you’re someone who keeps jars and canisters because “you never know, it could come in handy,” this project is for you! Etching glass can unify all of those spare mismatched glass containers with a simple yet custom design, be it a monogram or some geometric design. And, thanks to today’s selection of paints, the effect is very easy to achieve. The secret to the simplicity here is forgoing traditional etching cream, which consists of a number of diluted chemicals, for a frosted glass spray paint. While working with a glass etching cream entails donning work gloves and sponging a thick layer of cream over the open parts of a stencil and waiting for the chemicals to etch the glass, the frosted glass spray paint is a much more familiar medium. With it, you’re actually applying a flat, semi-transparent paint—one that can be removed, even, if you change your mind! 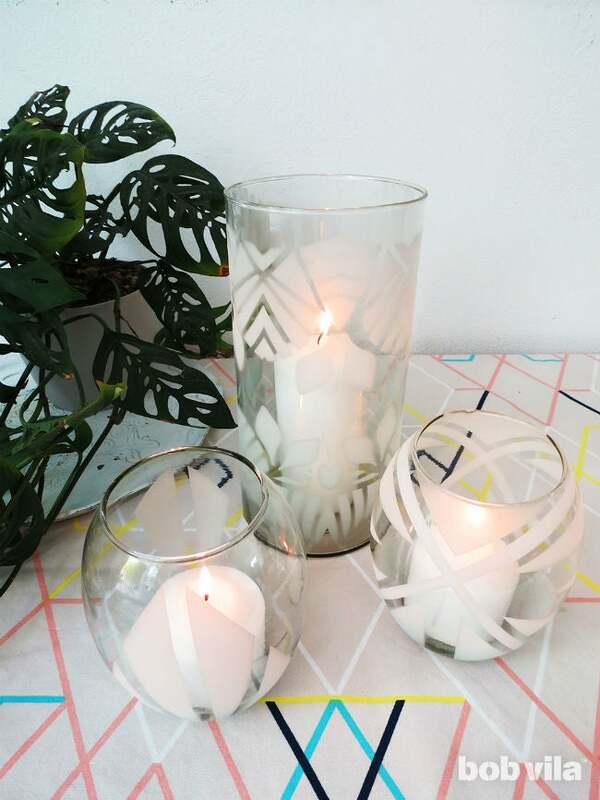 We’ll teach you how to etch glass and effectively turn old vases into candles votives, but the options are endless. Canning jars can become cool new drinking glasses. Heck, you can dress up plain-old current wine glasses! Keep reading for the only four steps you need to know. Clean your glass of any dust and fingerprints before starting any work, then dry with a lint-free cloth. Now, onto the design! You don’t need a full stencil to create a design; you can freestyle on the glass using the painter’s tape. Once you have a basic design on your glass, you can slice the strips lengthwise to make thinner, more detailed lines. All the areas you want to keep clear must be covered. Don’t hesitate to use a piece of newspaper to cover larger spaces you don’t want to be etched. Outside or in a well-ventilated place, apply a thin coat of frosted glass spray paint to your glass container. At first, the paint is almost invisible, but it will appear as it starts drying in the following 10 minutes. Spray two or three thin coats (following the manufacturer’s recommendations for dry time between passes) until you are satisfied with the result. Once the paint has dried, remove the tape. 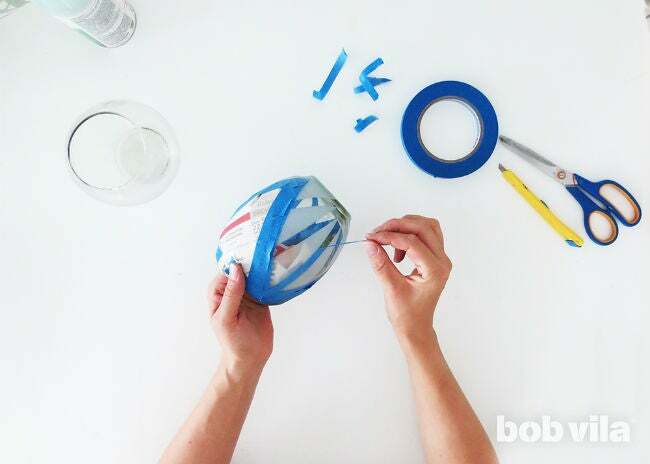 At this point, you can create an even more detailed design by applying new tape in several layers of painter’s tape. Don’t be afraid to overlap the dried paint; it shouldn’t flake went you take it off. Instead, after you repeat Steps 1 through 4, you’ll unwrap to reveal a new finished design with two levels of etching: The glass will be most opaque where it was etched twice and only lightly frosted where you’ve only etched once. After you’re finished, put the remade glasses to work. 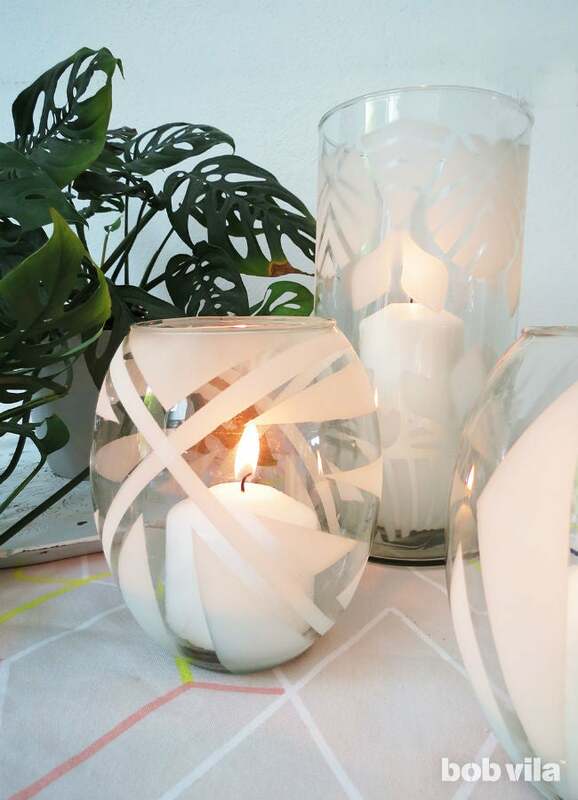 We placed some candles in these vases to light our cozy patio corner. If you use citronella candles, you’ll also keep bugs away during summer nights outside. 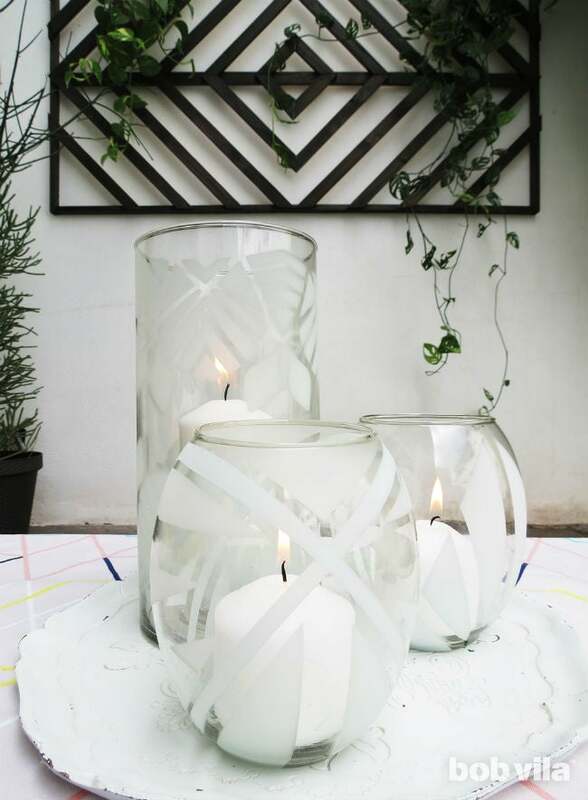 Etched glass tumblers and candle holders filled with citronella lights can help transform your outdoor entertaining area. You know what else will transform the patio space? 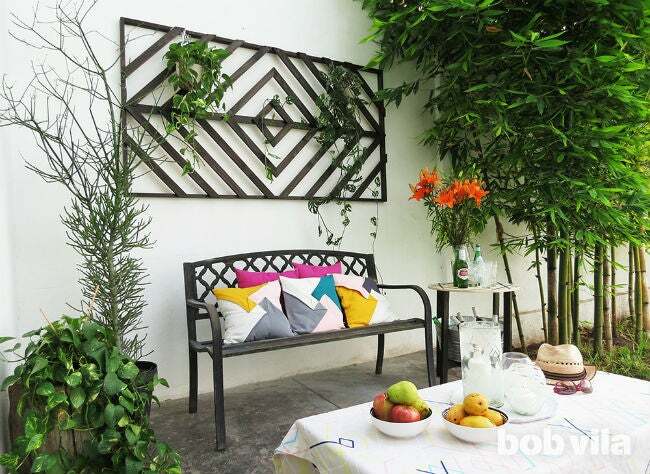 A DIY cooler table for refreshments and a geometric wall trellis. You can see them come together in the photo below and get their tutorials (as well as the rest of my past projects) here.